There are dragonflies called Snaketails or, rather, there are dragonflies named Snaketails by our American cousins. In the British English world, the Green Snaketail (Amerispeak) is the Green Clubtail (Britspeak). Naturally, the French-speaking world and the German-speaking world have other own names for the same things. Clarification across language boundaries is why standardized Latin (scientific) nomenclature is particularly useful. Just in case a foreign speaking person stumbles across any of my nature posts, I am trying to include the scientific name for things I see. This particular example will not cause confusion north of La Manche (the English Channel) because the Green Whatevertail does not occur here. We are not going to see one in The New Forest at any time of year. By being in The New Forest, however, we are in an area populated by some Odonata species that do not occur chez nous. At last, this morning the sun shone and the temperature rose to something approaching comfortable. If it’s comfortable for Franco and Francine, it is probably comfortable for the dragon- and damselflies. Given an excuse for a pleasant nature ramble in this delightful countryside, we set off à pied to visit Sway while the morning warmed up properly, followed by a search for some six-legged friends. We planed our return route via the first of the recommended (by New Forest Dragonflies) sites near Tiptoe. Bingo! Where on other days we had seen nothing, today we had some action. As well as several ubiquitous Common Darters (Sympetrum striolatum), I was excited and, as it turned out, frustrated to see several Golden-ringed Dragonflies (Cordulegaster boltonii) dragonflying around. Being of the hawker variety, they dragonflew around so much that they never settled. Neither did they even dragonhover and present a half-chance of a snatched photograph. Nevertheless it was my first sighting of a species that we can’t see at home. I was busily snapping away at a blue butterfly I didn’t recognize when hawkeyed Francine spotted another item of interest, a blue-bodied dragonfly. 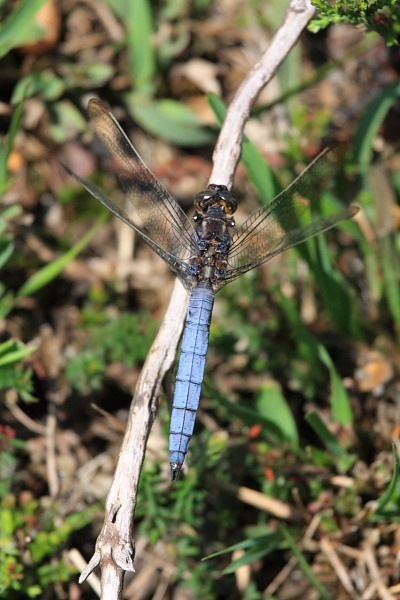 It seemed to be happy settling and resembled a Black-tailed Skimmer without its black tail. The necessary technique in such situations, to avoid missing what may be a fleeting opportunity, is to grab shots first, then, if possible, to take more considered shots. Finally, feel free to think about what you’ve seen. This we did. This specimen was a male Keeled Skimmer (Orthetrum coerulescens), another species that doesn’t occur at home and the first I’d ever seen. 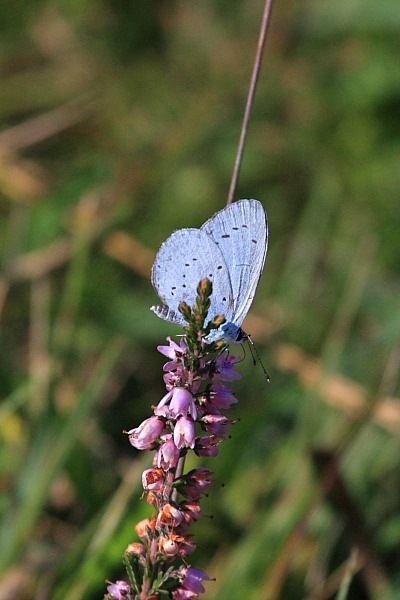 The blue butterfly turned out to be a Holly Blue (Celastrina argiolus). With photographs of two new species to add to the collection, the trip had definitely become very worthwhile. Our lunchtime and early afternoon were interrupted by irritating English showers but, since the morning sun and warmth had invigorated the Tiptoe insects, we thought it was worth investigating Crockford Stream, another of the recommendations. Again, there was a hawker buzzing about but refusing to play fair – fun to watch but no photo. 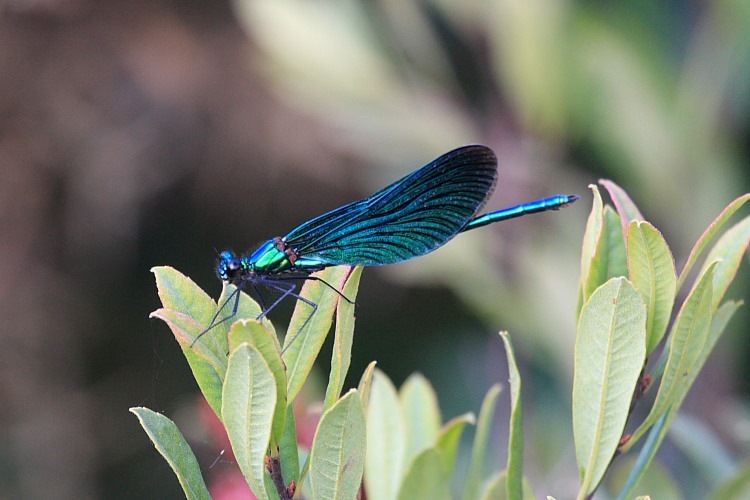 As compensation, we were treated by a flitting display of a Beautiful Demoiselle (Calopteryx virgo). We’d seen these in France for the first time this year but never before in England. This was yet another species that it is not possible to see at home. Furthermore, I think this was a different subspecies from that which we had seen in France. We made our way back to the car, happy with our new catalogue additions. A bigger surprise awaited us. Back at the car park, two chaps were hovering about while an older couple cowered in their car. One of the chaps out in the open cuddled a small, five-month old Sheltie, presumable to stop it becoming dinner for the cause of their concern. In a grassy ditch beside the car park, its head concealed in a bush, was a huge snake measuring about 5 feet. (I estimate this based upon the visible 4 feet which did not include its head.) The body of the snake was a good 2ins/5cms across so its girth must have been 6ins/15cms. We have, I think, three snakes in the UK: adder (a.k.a. viper), grass snake, smooth snake. The grass snake can approach 5 feet in rare instances but it is not a buff colour with dark red-brown patches on its back. This was an exotic import. The non-Sheltie-cuddling man called the rangers who, in turn, had called the RSPCA. The snake was thought to be a Red Boa constrictor that had been dumped by its scurrilous owner. Presumably it had grown to the point where caring for it had become a problem and it had been dumped. Such despicable people should be flayed alive and have salt rubbed in their wounds before being slowly roasted over an open fire. Any form of humane death would be too lenient. We really need enforceable laws to stamp down on the deplorable trade in all exotic creatures for the pet market – or any other market, come to that. 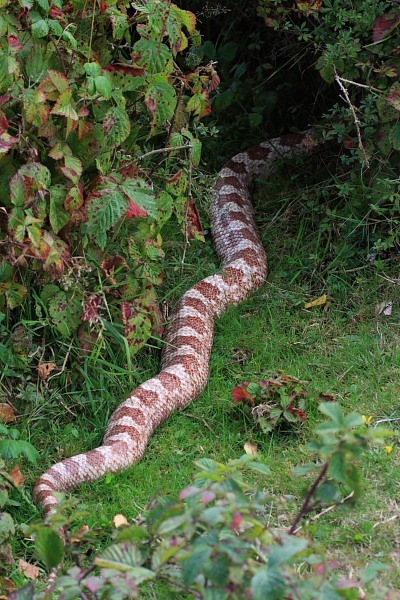 Anyway, who said there aren’t Snaketails in the New Forest?